We welcome further information on the company's history and development as well as any maps photos, documentation, brochures, etc, of the company. The story of Cuprinol goes back to Denmark in 1911 when O.P. Christianseen devised a process by which a copper compound was incorporated in spirit solvents to develop a product to preserve fishing nets. Over the next 20 years Christianseen’s company, A.S. Kymeia of Copenhagen, sold preservers based on this discovery in Scandinavia. In 1933, the National Smelting Company of Avonmouth first registered Cuprinol in the U.K. and bought the manufacturing and marketing rights worldwide, excluding Scandinavia, and set up a company to produce it. Manufacturing began at Avonmouth and four years later, the product was launched into the U.K. Retail Market. In 1937, an arrangement was made with Jenson & Nicholson Ltd. to fill and distribute Cuprinol through Retail outlets. The Second World War caused major disruption. The product disappeared from the Retail market as it was requisitioned for rot-proofing military and civil defence materials, and in 1941 the factory was partly wrecked by enemy bombing. 1951 saw Cuprinol re-organised into a new, independent company with Jenson & Nicholson now taking just under a half share. By 1958, Jenson & Nicholson had become sole owners and, in the same year, manufacturing plant and laboratories were moved to a factory at Adderwell, Frome in Somerset which had been occupied by William Pinchin & Co Ltd, who were already part of Jenson & Nicholson. The site is 15 miles from Bath and 100 miles west of London and occupies some 13 acres. At this time, administration and sales were based at Stag Place in London. As the company grew, various office functions were transferred to Frome until the move was completed when the new office block opened in 1965. In 1960 Jenson & Nicholson had amalgamated with paint-maker Lewis Berger to form Berger, Jenson & Nicholson Group (BJN) which, in turn, was acquired in 1970 by the German chemical giant, Farbwerke Hoechst A.G. In the early ‘80’s a major expansion took place with the opening of a new warehouse, distribution and office facility. In December 1987, Cuprinol’s ownership changed again when Hoechst sold the BJN Group to Williams Holdings, and Cuprinol became part of Williams’ Buildings Product Group. Just over 10 years later, In May 1998, Williams sold Cuprinol to ICI Paints. At the turn of the millennium, Cuprinol was employing around 230 people, approximately 150 of them at Frome. The acquisition of Cuprinol and other Williams companies significantly increased the number of sites owned by ICI. 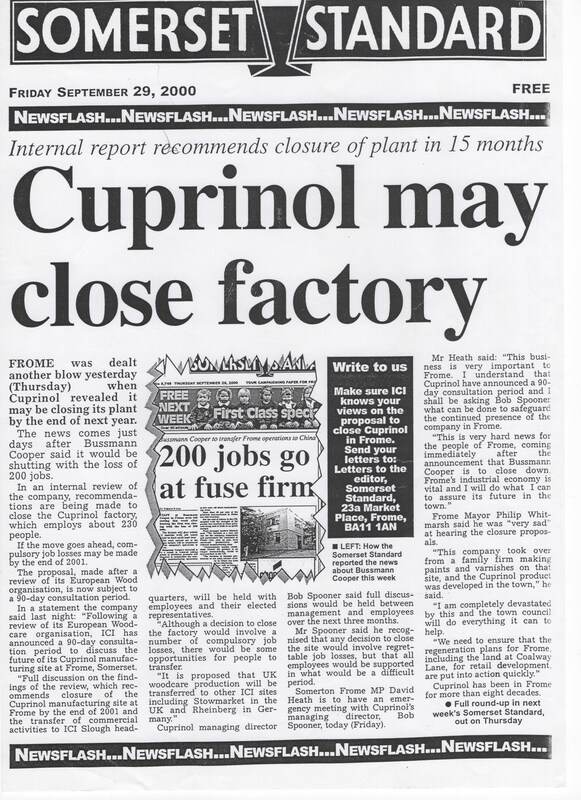 In September 2000, ICI announced that the Cuprinol site at Frome was to close within a year. The transfer of commercial, administrative and technical functions to ICI Paints Head Office at Slough as well as production and warehousing to a number of ICI production sites culminated in the closure of the Frome site at the end of 2001. At the time of writing (August 2005) the main warehouse facility at the Frome site remains whilst all other buildings (offices, laboratories, factory) have been demolished and ground-works have taken place in preparation for residential development. The Cuprinol Company is now integrated into the ICI Paints business at Slough. Prior to the Cuprinol occupation of the Frome site, there had been industrial activity there for around 200 years. There was a wool mill on the site between 1765 and 1813. Reference to early Frome maps and records at Longleat House show a factory at Adderwell in 1813. An 1853 map mentions a factory building and garden at Adderwell - proprietor William Rossiter. In the mid-19th Century, records show the factory was called Providence Mills and was occupied by James Holroyd who made dyes and chemical products for the woollen industry. Providence Mills had been built in 1857 and many of the original buildings were incorporated in the Cuprinol development until its final demolition. In 1903 the factory was purchased by Wallington & Weston Ltd. and used for the manufacture of rubber products. This company went on to relocate within Frome and became one of the town’s major employers. They too have recently closed. 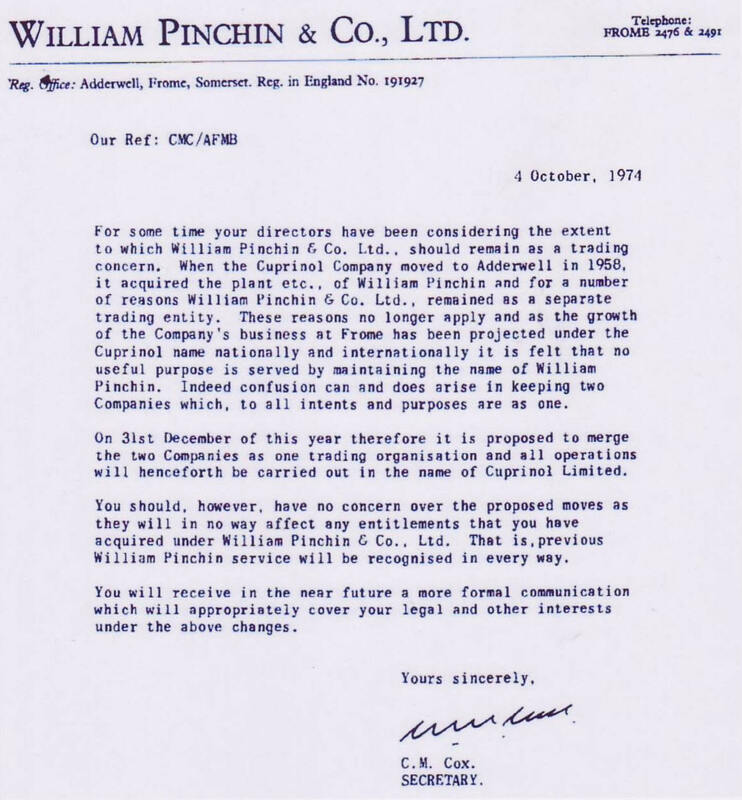 In the 1940’s, the factory passed to William Pinchin & Co. Ltd. who used it for the manufacture of paints prior to the arrival of Cuprinol in 1958. At some time, the site name became St. John’s Mills and, as such, has been recently referred to on some maps. 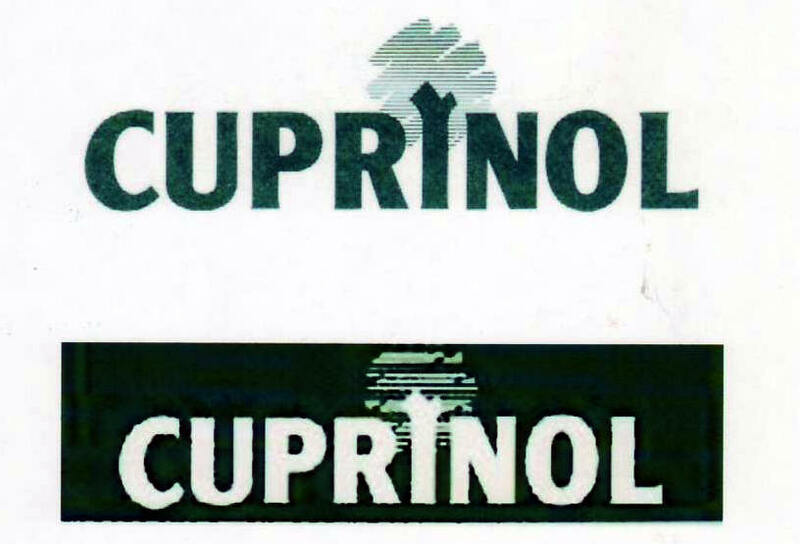 The original Cuprinol Green Preserver formed the basis of an expanding range of Wood Preservers and Eradicators (Rot & Woodworm Killers), giving Cuprinol a major share of their core market by the 1970’s. During the 1960’s some non-woodcare products from Cuprinol’s original heritage still existed such as Rope Preservative and ready-for-use Textile Preservers. The late 1970’s saw the beginning of an expansion of products from these core ranges, developing into today’s highly diversified range of Woodcare products. Exterior Woodstained joinery developed from Scandinavian practices led to rapid growth in the U.K. in the original application and Retail redecoration markets over the next 25 years. Woodstains became the largest Woodcare market sector and Cuprinol achieved an early Retail market leadership. Other growth came from interior Woodcare products – varnishes, dyes, polishes – but the major growth has come from Cuprinol’s core area – the care of wood in the garden. The growth of the garden as an extension of the living area has stimulated significant expenditure in garden-related items and Cuprinol has been well placed to capitalise on and promote this trend. It’s a fact that for years, many people have talked of “Cuprinolling” the fence! TV garden makeover programmes such as Ground Force have stimulated the introduction of wooden items into the garden – decorative fencing, decking, gazebos, summerhouses, sheds etc. - both from a practical and design viewpoint. The Cuprinol garden wood care ranges have grown significantly with wide colour ranges as well as application and appearance options and the brand is the major player in this sector. Full details of Cuprinol’s current product ranges are on the official Cuprinol U.K. web site. Cuprinol originally started in the UK Retail market and this sector has remained the major part of the business. The Professional/Trade User market developed as an integral part of the Retail business (indeed, the UK Retail/Trade business was known as “Merchant Division” until the late 1980’s). In the early 90’s, much-needed focus was given to the Trade Market with the introduction of specialist Sales and Marketing teams and special Trade products. Cuprinol also developed a significant presence in the Industrial Woodcare markets supported by specialist Sales and Marketing and Technical Support. The Pre-Treatment sector supplied industrial quality preservers to timber yards and manufacturers of finished products such as timber frames for housing, window and door frames, outdoor fencing etc. Product was often pressure-applied in purpose-built plant designed and developed by Cuprinol. The division also supplied Woodstains and Basecoats for factory application. The Remedial sector supplied products for application by Professional Remedial Contractors to treat rot and woodworm attack. The company had a nation-wide network of approved contractors using exclusively Cuprinol products in their area of the country. 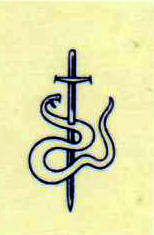 The company withdrew from its Industrial Markets in the mid 1990’s. Cuprinol also enjoyed considerable success overseas marketing specialist products (e.g. Termite Killer) as well as extending the sales of UK products. Cuprinol’s Export successes covered over 50 countries notably the Caribbean, the Middle East and the Far East. Whilst the Cuprinol brand will no doubt continue to be a major player in the Woodcare market from its new home in Slough, for many it’s spiritual home will be Frome for a long time to come. Cuprinol has been a successful company, operating under a “can do” ethos. Many people enjoyed the Cuprinol culture, working with their colleagues and their time with the company at Frome and look back on it with some fondness. Indeed, it was not uncommon for people who left the company to rejoin. Since the Frome site closure, annual employee reunions have been held near Frome and are well attended. A video capturing people, products, activities and events over 70 plus years has been produced and extensively requested. It’s title “Cuprinol – a Special Company….. and Special People” says it all! Additional information to the history of Cuprinol is most welcome.